I serve as an election worker. It’s kind-of an unwritten rule that the workers bring stuff to snack on because we have to be there without leaving for 14 hours. 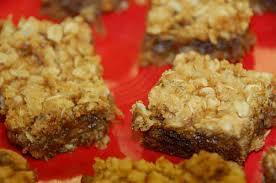 During the mid-term elections this November, a lady brought these delicious apple butter bars. When you make them, cut them small because they’re addictive! Combine 1 1/2 cups all purpose flour with 1 teaspoon of soda and 1 teaspoon of salt in a large bowl. Add 2 1/2 cups quick-cooking oats and 1 1/2 cups of sugar. Melt two sticks of butter (1 cup) and stir into oat mixture. Press about half in the bottom of a greased 9 X 13 pan. Top with 1 1/2 cups of apple butter. Sprinkle remaining crumb mixture and gently press with a spoon.